Business trends still look pretty good for many enterprise software firms whose shares have taken off. Microsoft has been on a tear. Earnings season hasn't done much to curb Wall Street's enthusiasm for most enterprise software high-flyers. Enterprise IT spending looks pretty healthy, as fairly healthy macro conditions motivate companies to loosen their purse strings a bit. Software spending growth continues to outpace broader IT spending growth, partly due to how companies are prioritizing investments in areas such as security, analytics and marketing software. The industry's ongoing shift from traditional software license sales to frequently-updated subscription offerings featuring some mixture of PC, cloud and mobile apps is growing how much companies choose to spend on many popular software suites and platforms over the long-term. Many larger software players have had a fair amount of success cross-selling relatively new offerings to customers of their most popular products. For example, Red Hat (RHT - Get Report) has made a lot of headway selling middleware, storage software and container management software to its Linux server OS base. And Salesforce.com (CRM - Get Report) has been quite successful at selling things like marketing, customer support and e-commerce software to buyers of its widely-used salesforce automation software. 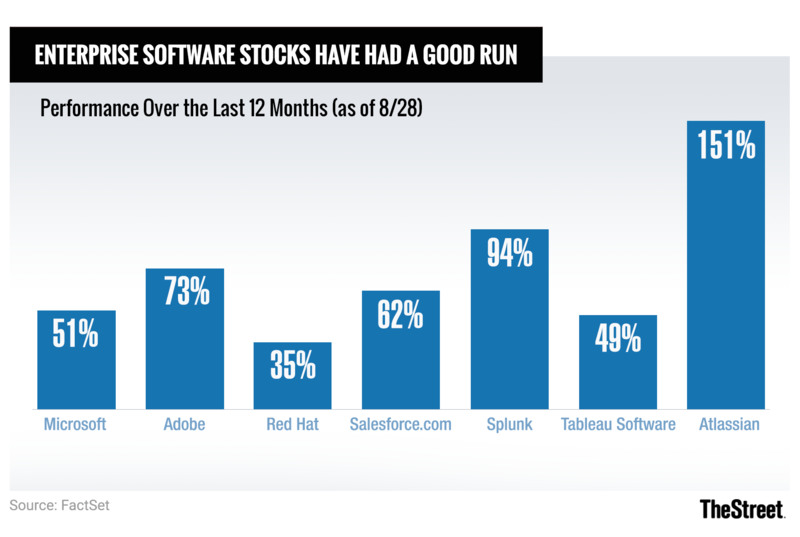 Here's a look at the numbers posted by five major enterprise software firms since mid-July. Microsoft (MSFT - Get Report) beat June quarter estimates on the back of 17% annual revenue growth, and issued mostly above-consensus September quarter sales guidance. The rapid growth of Microsoft's Azure cloud services platform helped out, but so did the strength of several software franchises. Microsoft's Windows commercial revenue, which is driven by licensing deals with businesses, rose 23% annually last quarter. And a pickup in business PC demand helped its Windows OEM Pro revenue rise 14%. Office 365 demand helped Microsoft's Office commercial revenue rise 10%, while demand for the Dynamics 365 cloud business app suite helped Dynamics app revenue rise 11%. Both of those growth rates were slower than what was seen in the March quarter, something that Microsoft attributed to an accelerated shift towards Office and Dynamics 365 subscriptions from traditional licenses. The company forecasts double-digit sales growth for its Productivity & Business Processes segment, which covers Office, Dynamics and LinkedIn, for fiscal 2019 (ends in June 2019). Salesoforce.com and Microsoft are holdings in Jim Cramer's Action Alerts PLUS member club. Want to be alerted before Jim Cramer buys or sells CRM or MSFT? Learn more now. The German software giant slightly missed Q2 EPS estimates, but beat revenue estimates while reporting 4% annual sales growth on a euro basis and 10% growth on a constant currency (CC) basis. It also slightly hiked its full-year revenue guidance, forecasting total revenue will rise 6% to 7.5% in CC and cloud and software revenue 7.5% to 8.5%. With the help of both good organic growth and its recent acquisition of sales software firm Callidus, SAP's (SAP - Get Report) cloud subscription and support revenue rose 40% in CC in Q2 to 1.21 billion euros. Traditional software license and support revenue (pressured by cloud adoption rose a modest 3% in CC to 3.73 billion euros. SAP now expects 34% to 38% CC-based cloud subscription and support revenue growth this year. While VMware's (VMW - Get Report) shares saw some post-earnings profit-taking last week following a decent run-up, its number were hardly awful. The virtualization software giant beat July quarter estimates while reporting 13% total revenue growth and 15% license revenue growth. It also issued slightly above-consensus October quarter guidance, and hiked its fiscal 2019 (ends in Jan. 2019) revenue and EPS outlooks. VMware, which has made a flurry of announcements this week at its annual VMworld conference, continues seeing strong growth for its vSAN storage virtualization platform and its NSX networking virtualization platform -- vSAN and NSX license bookings respectively rose 40% and 70% annually last quarter. And though VMware's mainstay server virtualization business remains pressured by tough competition and cloud infrastructure adoption, it managed to see moderate bookings growth last quarter with the help of partnerships with Amazon Web Services (AWS) and other cloud service providers. The machine data analytics leader's shares jumped to new highs last week after it beat July quarter estimates on the back of 39% revenue growth, issued strong October quarter guidance and hiked its fiscal 2019 (ends in Jan. 2019) sales guidance. Splunk's (SPLK - Get Report) license revenue, which drives future maintenance revenue, rose 36% last quarter and easily beat estimates. And though it was only about 10% of total sales, the firm's cloud subscription revenue rose 90%. Driving much of this growth: The use of Splunk's analytics and management tools, which were once primarily used to monitor the health of a firm's IT infrastructure, for a broader set of use cases that include security, fraud-detection and IoT device analytics. The CAD/CAM software giant soared last week after it beat estimates, reported strong billings growth (24%, if the older ASC 605 accounting standard is used) and slightly upped its fiscal 2019 (ends in Jan. 2019) revenue and EPS guidance. Much like Microsoft and Adobe ( ADBE - Get Report) , Autodesk's ( ADSK - Get Report) revenue shift from licenses to subscriptions has gone pretty well. Subscription revenue more than doubled last quarter to $420.6 million (over two-thirds of all revenue), easily offsetting a large drop in traditional maintenance revenue. Total subscriptions grew by 119,000 sequentially to 3.94 million, and Autodesk is guiding for 500,000 to 550,000 net subscription adds for the whole of fiscal 2019.